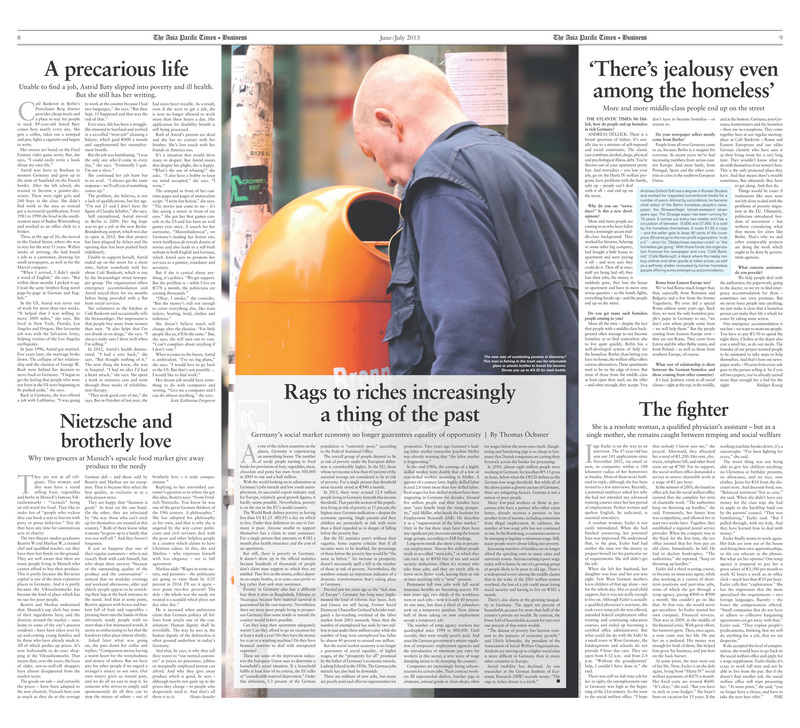 Ruediger Rossig - "There’s jealousy even among the homeless"
start | Interviews | "There’s jealousy even among the homeless"
"There’s jealousy even among the homeless"
Mr Düllick, how do people end up homeless in rich Germany? Andreas Düllick: There is a broad spectrum of failure. It’s usually due to a mixture of self-imposed and social constraints. The classic case combines alcohol, drugs, physical and psychological illness, debt. You’re thrown out of your apartment pretty fast. And nowadays – you lose your job, go on the Hartz IV welfare program, have problems with the family, split up – people can’t deal with it all – and end up on the street. Why do you say “nowadays?” Is this a new development? More and more people are coming to us who have fallen from a seemingly secure middle-class background. They worked for Siemens, Schering or some other big company, had bought a little house or apartment and were paying it off – and were sure they could do it. Then all at once, staff are being laid off, they lose their jobs, the money is suddenly gone, they lose the house or apartment and have to move into worse quarters – so the family fights, everything breaks up – and the people end up on the street. Do you get many such homeless people coming to you? More all the time – despite the fact that people with a middle-class background often manage to not become homeless or to find somewhere else to live quite quickly. Berlin has a well-developed system of help for the homeless. Rather than letting you have no home, the welfare office offers various alternatives. These apartments tend to be on the edge of town. But most of those from the middle class at least open their mail, see the offer – and often enough, they accept. You don’t have to become homeless – or remain so. Do your newspaper sellers mostly come from Berlin? People from all over Germany come to us, because Berlin is a magnet for everyone. In recent years we’ve had increasing numbers from across eastern Europe. And more lately, from Portugal, Spain and the other countries in crisis in the southern European Union. Roma from Eastern Europe too? We’ve had Roma much longer than that, especially from Romania and Bulgaria and a few from the former Yugoslavia. We even did a special Roma edition some years ago. Back then, we were the only homeless people’s paper in Germany to say, “we don’t care where people come from – we will help them.” But the people coming from Eastern Europe now – they are not Roma. They come from Latvia and the other Baltic states, and from Poland – as well as those from southern Europe, of course. What sort of relationship is there between the German homeless and those coming from other countries? It’s bad. Jealousy exists in all social classes – right at the top, in the middle, and at the bottom. Germans, non-Germans; homeowners and the homeless – there are no exceptions. They come together here at our regular meeting-place at Café Bankrott – Roma and Eastern Europeans and our older German clientele who have seen it as their living room for a very long time. They wouldn’t know what to do with themselves if we weren’t here. This is the only protected place they have. And that means there’s trouble sometimes. But ultimately they have to get along. And they do. Things would be easier if institutions like ours were not left alone to deal with the problems of poverty migration in the EU. Ultimately, politicians introduced freedom of movement – but without considering what that means for cities like Berlin. That’s why we and other comparable projects are doing the work which ought to be done by government agencies. What concrete assistance do you provide? We help people deal with the authorities, the paperwork, going to the doctor, or we try to find emergency accommodation for them – sometimes our own premises. But we never force people into anything; we just make it clear that a homeless person can make their life a whole lot easier by taking some action. Our emergency accommodation is not free – we want to motivate people. You have to pay €1.50 to spend the night there. Clothes at the depot also cost a small fee, as do our meals. The founder of our project wanted people to be animated to take steps to help themselves. And that’s how our newspaper works – 90 cents from every sale goes to the person selling it. So if you sell two papers, you’ve already earned more than enough for a bed for the night. Andreas Düllick (54) has a degree in Korean Studies and worked for respected conventional media for a number of years. Almost by coincidence, he became chief editor of the Berlin homeless people’s newspaper, the Strassenfeger (street-sweeper) seven years ago. The 32-page paper has been running for 15 years. It comes out every two weeks, and has a circulation of between 15,000 and 27,000. It is sold by the homeless themselves. It costs €1.50 a copy – and the seller gets to keep 90 cents of the cover price. 60 cents go to the non-profit organization “mob e.V.” – short for “Obdachlose machen mobil” or “the homeless get going.” With those funds, the organization finances the newspaper and runs “Café Bankrott” (Café Bankrupt), a depot where the needy can buy clothes and other goods at token prices, as well as a self-help shelter renovated by former homeless people offering some emergency accommodation.